You know that feeling when something you’ve been really looking forward to turns out to be a crushing disappointment? For the longest time I’ve been looking forward to Bandai Namco’s Idolm@ster franchise to come out west (in terms of the main series video games, I mean. I know there's been some limited anime and mobile game releases, but almost nothing into Australia). It’s a game about pretty girls singing and dancing and… well, what else do you actually need to know to know it’s something that by all rights I should love? Among games that I wish had been made available in English in the west, Idolm@ster has been right up there for a very long time now. Related reading: For contrast, the Hatsune Miku VR concert game on PlayStation VR is absolutely incredible. Matt's review. I don’t really understand why it hasn’t been, either. Over in the homeland it’s an outrageously popular franchise. You only need to look at the enduring popularity of groups like AKB48 to understand why. Of course it wouldn’t be anywhere near as successful outside of Japan, but surely if something like Hyperdimension Neptunia or Hatsune Miku can get a look-in and establish a stable fanbase among the lovely western otaku folks, so too could Idolm@ster. Perhaps Bandai Namco has finally woken up to that, because we finally have an Idolm@ster in English on console. But why Bandai Namco thought that The Idolm@ster: Cinderella Girls Viewing Revolution should be that first game utterly boggles the mind. 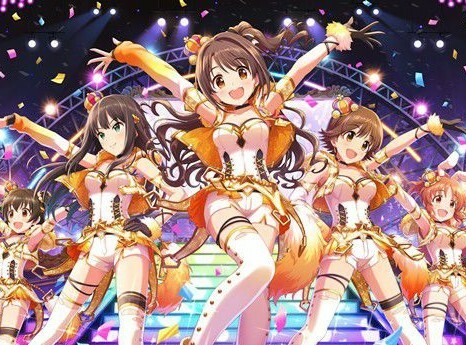 Actual Idolm@ster games have narratives and light simulation gameplay, as you take on the role of a managing a squad of aspiring idols and are responsible for helping them to achieve the kind of stardom that, one assumes, drives girls in the real world to sign up to AKB48. As their manager you need to set the schedules for each day, including training, auditions, and giving them directions as they perform on stage. It’s all very light and breezily casual in execution, but these games are also a lot of fun. Critically, the games are all about the characters, too, and because you spend so much time directly interacting with them in Idolm@ster, people very quickly develop genuine favourites. 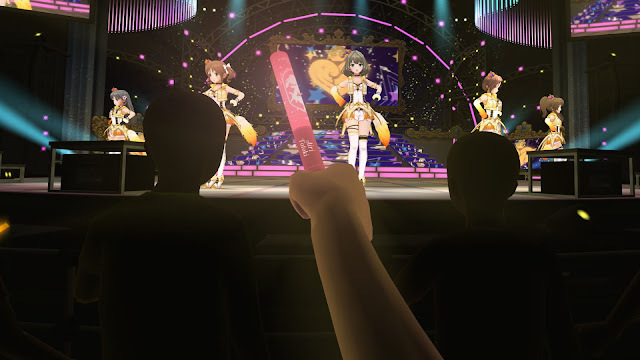 Cinderella Girls, on the other hand, is a pure concert experience with next to no interactivity, other than the ability to wave a glowstick around like a madman, or shift between a couple of different places in the audience to see the performance from a different angle. On a very basic level it works. In VR the game is absolutely gorgeous, with great set design, and the girls are utterly beautiful in detail and sing and dance with all the energy of real pop idols. 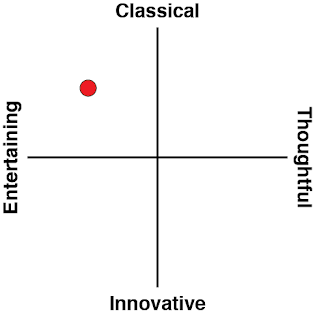 However, as a game, this is quite terrible, even within the context of the tiny niche for virtual concert experiences. It’s not that I don’t like virtual concert applications. I’ve spent a lot of time watching Hatsune Miku in concert through the Miku VR games. Heck, they’d be up there with my most played games this year if we’re talking raw time spent in the app. But there’s some significant differences between what SEGA did with Miku, and what Bandai Namco have done with Idolm@ster that make SEGA’s game something very special, and this one quite dry and dull. Most obvious of these is the ability to get up on the stage itself in the Miku VR games. You can’t interact with Miku or the other vocaloids when you’re on stage, but they’re there dancing and singing what seems like centimeters from you, and that is just wonderful. Yes, it’s a little immersion breaking when they’ll run forward on the stage and run right through you, or you’ll reach out to where they would be and not touch anything, but having been to real-life Hatsune Miku concerts, I’ll take a minor hit to my suspension of disbelief in order to have Miku right there in front of me. Trade-offs don’t get more logical than that. With Cinderella Girls, though, you’re only ever in the audience, and it’s just not as exciting. The view from the crowd is great and the game does a great job in setting the atmosphere of a concert, so it’s immersive enough, but as developers became more familiar with VR technology, I would have thought the natural progression with regards to virtual concerts would have been for developers to take the on-stage experience and make it interactive, not take access to the stage away completely. There’s not even any reason to swing the glowsticks that are in your (virtual) hands. Again, to compare to the Miku concert games, in playing them you get rewarded for pounding the air in time with the music by improving an “energy” meter. Get it to a certain point and the characters will change costumes from their default costumes to something fun and in the theme of the music track. Even better, if you do it well enough over three music tracks, you then get to enjoy a super special private performance of just you and Miku, and you can pick what she should wear for that show and everything. Meanwhile, with Cinderella Girls there’s no reward for playing with the glowsticks, and the concert is over after one track. I got bored enough that I made up my own game where I used my glowstick to beat the head of the virtual concert goer next to me. That’s wish fulfillment in a sense, I guess. I never get to do that in real concerts. If this exact same game was made of an virtual idol franchise that I am familiar with - Love Live!, perhaps - then I’d have a different impression again. Because when the game’s all about watching pretty girls perform in concert who those pretty girls are is important (and Honoka in VR would be A+++, just sayin’). That is why, again, it’s so odd that Bandai Namco would pick this one as the first Idolm@ster game on console for the English-speaking audience. Finally, there’s the issue of pricing. Cinderella Girls is expensive, to understate things. The base download (itself not that cheap) gives you access to just three songs, and around a half dozen other songs, as well as customisation for your in-concert avatar and glowstick, need to be purchased via DLC. Buy it all and you’re looking at a total cost close to two of the most expensive retail games. 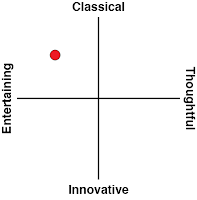 I’m not usually one to complain about the cost of things, because I’m usually more interested in the quality and artistry of the experience, but the general lack of interactivity involved means that, even if you enjoy the music, each track becomes pointless as a “game” experience after a couple of plays (just buy the music CD). At over $10 a track, that’s simply not acceptable. Even the “bonus” PS4 theme that you get for buying the base game is pointless and poorly optimised, since the art is of the Idolm@ster girls performing in concert, but the PlayStation 4 game icons block out the upper half of their bodies. As utterly lovely as their legs are, the lack of optimisation makes the wallpaper about as cheap as PlayStation themes come. Related reading: To give you an idea of what the actual Idolm@ster games are like, Hyperdimension Neptunia: Producing Perfection on the PlayStation Vita is similar. I always wondered if I had a threshold when it comes to games about pretty anime girls. I guess this is it. 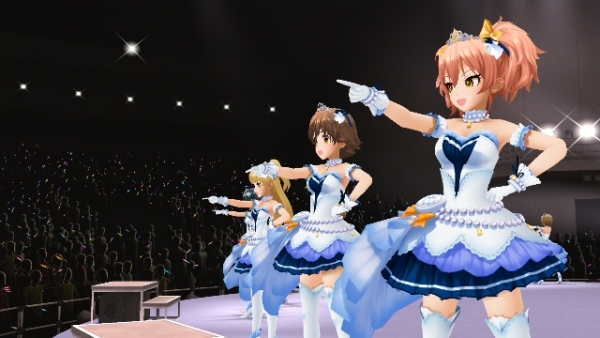 I hope Bandai Namco wasn’t using Cinderella Girls as a gauge for interest in Idolm@ster in the west. I hope that somewhere down the track a proper Idolm@ster game lands in my lap, because I am still incredibly keen on the franchise and I suspect as I slowly become more acquainted with it, down the track I’ll revisit this and absolutely love the idea of watching my favourite virtual idols performing on stage in VR. 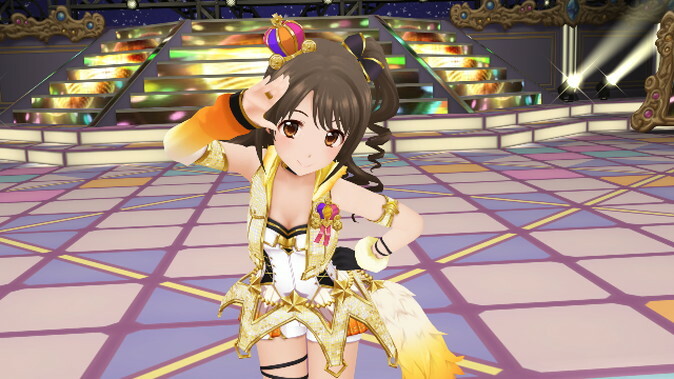 For now, though, Cinderella Girls is a downright strange release and I worry that it will do more harm to whatever commercial potential Idolm@ster has in the English-speaking world than it will do good.